The WPRE8150KWT offers a good mix of versatility and efficiency. It boasts a number of intuitive and energy efficient features such as the variable wash temperatures, the water variable feature and the second rinse feature for removing all traces of detergent from the clothes. It also comes done in a classy white exterior for elegant simplicity. The WPRE8150KWT is an Emery star qualified machine that ensures savings all year round, in power and in water. The unit sports PreciseFill Auto Load sensing technology that automatically measures the load size and adds just the right amount of water. It also features the HydroWave with the Infusor Wash system, which uses a gentle pulling system to clean the clothes. The WPRE8150KWT sports multiple wash cycles and spin speed combinations for matching the right kind of fabrics in the load and delivers optimal cleaning results. The unit also comes with the RainShower Rinse system, which utilizes less water but provides similar cleaning performance to a more sophisticated washer. The unit comes with 6 wash/rinse temperatures so you can customize your temperature according to the kind of fabric in order to avoid damaging delicate fabrics. The unit also sports specialty cycles for washing special kinds of fabrics, from towels to sheets and jeans. Use less water with the variable water feature which allows you to use just the right amount of water for the load. Get clean loads of laundry without the strong smell of detergent with the second rinse option which gives clothes one final wash to remove all traces of detergent. The stainless steel tub can endure more washings and cycles compared to tubs made of porcelain and plastic. The extended spin cycle is yet another feature that you can use for optimal washing results. The WPRE8150KWT is available in white with a titanium backsplash color. It sports an LED status indicator which also shows the cycle countdown. Total volume: 4.1 cu. ft. The choice for different temperature options is what makes this unit very effiicient. You can choose hot cold for whites, warm cold for lights and cold cold for very dark colors, which reduces the risk of damaging your fabrics with a temperature which is too high. The large capacity makes it perfect for doing larger loads at a time. This makes it perfect for those with large homes. One of the main advantages with this unit is that it spins so hard and produces a lot of noise due to the vibration. The unit also does not clean clothes too well. Fabrics often retain an odor and washing cycles take a long time to finish especially when washing very thick clothes. Machine takes a long time to clean clothes. Clothes also end up wrinkled and odors are not easily removed. Comments for GE WPRE8150KWT Top Load Washing Machine 4.1 Cu. Ft. I have this machine, and it does not get my clothes clean at all. Don't follow the directions for filling. Add only a couple of shirts and one pair of pants, and maybe you will get some clean clothes. You will get no savings with this machine, because you have to do two loads for every one of what you are used to in your 10 year old machine. This does not save water or energy. I will be scrapping my machine, when Tax returns come in, and not even donating it to the Goodwill, because the people there can't afford a machine that won't even clean their clothes, no matter how "new" the machine. What a waste of money. I will most likely never go with a GE brand ever again. This washer is a good candidate for false advertising. nothing energy efficient about it. Got it for large load capacity & water saving. Have to second rinse everything and H E detergent expensive. Noisy wash & spin cycle and all clothes come out tied in knots. Have to shake out so wont take twice as long to dry. Had repairman out cause agitator top comes off and floats in machine. There is a bolt under the agit. cap that is rusty. I ask for rust proof bolt and repairman said can't have anything else. Have to use same rusty bolt which gets stain on clothes. Will never waste money on GE again. Should be recalled and trashed with full refund to customers. I agree with all the bad things said by everyone else about this machine. The washer won't fill properly, you can't change a setting after you've started the machine because if you do the stupid thing drains all water (& soap) and you have to start over. All of my clothes come out of the wash still smelly and twisted into knots. The very WORST is that the machine never completely drains (and no I don't have a clogged drain line, checked that). We went on vacation for 2 weeks and when we came back the entire room reeked from the foul smell of, what was by that time, dirty germ-filled stagnant water in the bottom of my machine. This machine is a health hazard. I will never buy another GE appliance again. And, my companion GE dryer doesn't work any better. Maybe its a good thing GE is moving their corporate headquarters to China. Don't waster your money buy non-energy saver get clean clothes! I hate this piece of crap! If you want clean unwrinkled clothes only put in about 8 to 10 pieces and set it on super because the tub only fills 1/3 or less of the way up with water. I gave it 2 stars instead of 1 only because it is quite. Then again the thing barely agitates. Do not buy an energy star appliance you don't save a dime because you must wash clothes twice and rinse twice just to get them half as clean as the old washer did! 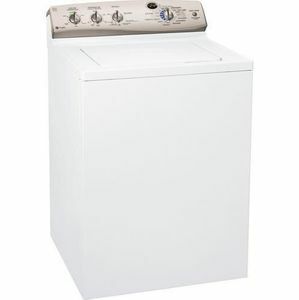 I hate this washer and wish I had stuck to the non energy saver instead of listening to my husband. I only gave this machine 1 star because there is nothing less! I am thoroughly disgusted with this piece of junk and hope someone reads these reviews before they make the same mistake we did. The water does NOT cover the clothes and certainly does NOT clean them. I am still trying to get ABC Warehouse to take them back and give me a functional machine. Wish me luck and DO NOT buy this machine!!! Worst washer ever. Wish I'd stuck with the old-fashioned machine that actually uses water. My clothes are in a wrinkled, tortured wad no matter how many or few are washed. They're not clean - still smell. Darks are linty. And why have a manual water level option when the "Super" setting only fills 1/3. I researched before buying and specifically opted for a machine that would let me set the water level. False advertising! I will NEVER buy another GE appliance again. What a rip off (unless you like your clothes dirty - AND wrinkled - but wait, you can just throw them in the yard with the dogs to get that result). Worst appliance I have EVER owned! We had a front loader which did not clean clothes as well as my traditional old style top loaders, so I bought the large capacity Profile to get back to a top loader. The appliance salesperson told us we could override the "energy saving" low fill feature---not true. Wish I would've followed my first instinct and returned it, but I gave it a try. What a nightmare! I do not think the sensor actually senses anything. The machine fills up with a miniscule amount of water in the bottom; clothes stick out up top totally dry while the machine goes on "soak" mode....huh? My answer to this was to put a hose in the stupid thing and fill it up! Unfortunately, I couldn't always catch the rinse cycle. Clothes were NOT clean. They smelled bad, and even with the spendiest detergent and longest cycles, they just weren't clean. Our fleece jackets came out with weird lint-y stripes of filth. Clothes seemed wrinkled and balled up, too. And the fabric softener dispenser on the bottom of the washer was useless. The water rinsed it out, it didn't hold enough, and half the time it ran out as I added it. I also had the experience of trying to change the cycle and being blocked by the stupid thing draining out, along with unused detergent. SO, after putting up with this inferior piece of garbage, waiting for the day I could replace it (I was shooting for one year), the stupid thing stopped working after about 8 months. We think it was something in the electronics. The display read "LID" to indicate the lid was opened when it wasn't, and then, just froze with the display on but no action. We had someone off Craigslist haul it away, and I bought what I should have purchased in the first place to match the dryer I had replaced two weeks earlier (a nice set of front loading Electrolux machines). BE WARNED AND KEEP AWAY!!!! almost bought this washer today. SO GLAD I DIDN"T! Horrible ! Run ,dont walk, away from this machine! Hated it from day one. Wont fill with enough water to even cover the load. Today Had to wash my husbands fleece jacket 3 times in order to get it clean,lint in creases, and dirt ! Washer wont agitate enough to even open up the clothing.And the manual water regulator is a joke. I know that the auto sensor (water sensor) kicks in regardless of the manual setting you cant overide the auto sensor,they just make you think you can! The only way to get it to give me more water on the inital fill is to actualy put the detergent bottle ( full, to increase the weight in the washer)) in the washer with the wash and then pull it out. I figured this out because you cannot interupt this washer once it starts you cannot decide you want to change any settings once started because it will dump out all the water,and start again! ( brain Dead )or no brain at all! anyway I had hubbys jeans 3 pr in the wash manual supersize load and it dumped the water, restarted it with the wet jeans and low and behold it filled with a decent amt of water and I never changed the supersize manual setting! I have had to wash sheet's (Queen size cotton ) top and bottom sheet 2 to 3 times just to get them clean. Have to wash flannel sheet's seperatly and have washed a light weight light yellow blanket only to find when I opened it up creases of dirt and lint everywhere the blanket was creased in the machine. This machine is going back to SEARS next week even if I have to pay a 15% restocking fee! GE needs to get their act together or quit advertising energy efficient/water saving washing machines. I purchased this washing machine new in Nov. 2010 and it has already stopped working.....completely...and it is only Jan. 2011. I went through all the trouble shooting tips......including unplugging the machine for two minutes to reset it....and nothing. The receptical has electricty at the wall so it is internal to the washing machine. I'm calling GE repair ASAP. From previous complaints, it looks like these machines are lemons.....Where's the Tequila and salt? Worst washer I have ever had. If you buy this item you must get the extended warrantee. I have had to have GE representatives come out 3 times in 4 years and replace the whole unit 3 times and one time with the engine and all the clamps. The repairman crudely said to my son.... Here I'll leave the broken parts so in a few weeks you can just call in and tell us what parts you need replaced because they will be the same parts. He also said ---see how it is now fixed- and yes it work great in front of him only because it did not have any clothes in i-t he ran it empty. It does work great when run empty. Putting clothes in it is another matter. After one month and only used twice. Judging the size of the load is supposed to tell the spin cycle. But on small load with 2 pairs socks- child 4, a sweat shirt size child 4, and sweat pants size child 4. caused the washer during the spin cycle to move across my level basement floor. NOw broken again---all done with GE. I bought the larger GE Profile top load washing machine and am terribly disappointed. It is the worst washer I have ever owned. When I use the feature to save water and let the washer determine how much water to use, I end up with some pieces that don't even get totally wet!! When I choose the water level, I still have to do a second rinse or there will be fabric softener all over the clothing. I'm wasting water, wasting time, wasting detergent and fabric softener. No more GE for me! I had to have this washer fixed 3 times in the first year,2transmissions,and drive motor.I purchased the extended warranty,because i new i would need it.